Last month I announced my new obsession project: Literary Kicks will be publishing one e-book a month for the next year. The new book is now out! 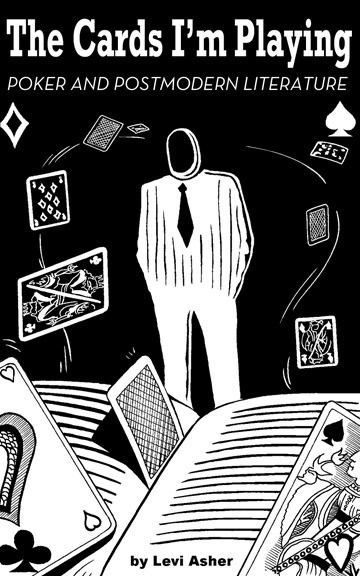 It's a literary book about poker, and it's called The Cards I'm Playing: Poker and Postmodern Literature. I'm going to write about the book tomorrow, but today I want to share some lessons I've learned during my quick education as an e-book publisher. Part of the fun of e-book publishing in 2011 is a sense of community, innovation and adventure, and I hope the points below will help others who are launching their own e-book ventures. 1. Cover Art: I began this project with one absolute principle: any e-book published by Literary Kicks is going to look good. I don't understand why other e-book publishers put out such shabby-looking product. For the cover of The Cards I'm Playing, I'm proud to present a design by Vince Larue, an up-and-coming graphic artist from France. Working with Vince was a pleasure: I told him what I wanted, he sent a couple of quick sketches, and within 36 hours I had the final draft that you see on this page. I love this cover -- merci beaucoup Vince! 3. Publishing Services: To produce an e-book, you must choose one or more publishing services, and pray for a minimum of technical hassle. E-book publishing is a fast-changing field, but right now there are two essential services you can use to cover the main bases: Amazon's Kindle Direct Publishing (for the Kindle version, and for that all-important Amazon page) and Smashwords (for ePub and every other format, including versions for iPad, iPhone, Android, Kobo, Nook, etc.). If you have the time to spend (and, honestly, I don't) you may also want to bypass Smashwords for some formats and publish directly with various services like Nook and Apple. I plan to reach more platforms directly in the future, but if you're just starting out in the e-book business (as I am) you may want to avoid wasting too much time conforming to a tangle of different platforms. Both KDP and Smashwords accept documents in Microsoft .doc format, and my goal (though I have not yet reached this goal) is to be able to prepare a single .doc version that will successfully publish on both platforms. Kindle Direct Publishing is excellent, fast, efficient and easy to use. I had plenty of problems working with it, but the problems were usually my fault, not the platform's. Smashwords has a harder job to do than KDP, because it produces output in multiple formats and therefore imposes more rules and conditions. Unfortunately, at this moment I still do not have Smashwords versions I'm completely happy with for either my first e-book Why Ayn Rand is Wrong (and Why It Matters) or the new one. I am working hard on this, and will let you know when I've got the results I want. Both of my e-books are for sale on my Smashwords page, and I think they're about 95% ready for prime-time at this moment. But I'm not going to push my Smashwords versions until I'm 100% happy with the formatting, and I'm not quite there yet. 4. Finding Readers: This should be the biggest question of all: how will you get people to buy your books? If you don't have a good answer to this question, e-book publishing is probably not a good use of your time. When I began this project I pledged to focus my efforts completely on sales success. I'm not going to pat myself on the back because my Amazon page looks pretty. I love what I do, but this ain't no labor of love. My only goal here is to sell books (and, I'm happy to say, my first e-book is performing well, and remains in the top 100 in Amazon's Politics/Ideologies bestseller list today, more than a month after publication). My strategy with Literary Kicks Publishing in 2011 has been to turn the big question 180 degrees. Instead of asking "how will I get people to buy my books? ", I ask "what books am I interested in writing that people will want to buy?" Fortunately, I have a laboratory to work with: my blog covers a wide range of popular topics, and I can tell by looking at my traffic reports which topics are hottest. I was very passionate about a series of articles I wrote debunking Ayn Rand's ethical philosophy earlier this year, but it was not my passion but rather the fact that readers seemed to respond so quickly to these articles that inspired me to publish the first e-book in the series. Poker is another natural choice, since readers have always liked my articles about my favorite game, and I think the topic of Texas Hold 'Em brings out the best in me as a writer. I hope The Cards I'm Playing will appeal to anyone interested in either the psychology and strategy of the game or in the playful, sneaky aspect of creative writing. This book is about the zone of life where the two meet (this is the zone where you can always find me). I'll be posting again here with a more substantial focus on the book itself tomorrow. Then I'll be off to spend several days this week at BookExpo 2011 ... where you better believe I'll be paying extra-close attention to e-book buzz. 9 Responses to "From Concept to E-Book: Practical Lessons From a New Publisher"
I agree with you about Kindle and Smashwords. They seem to be the best combination. I am also looking at Red Lemonade as a potentially good venue. Levi, I just take my MS Word docs of stories or diary entries or nonfiction pieces and use the Kindle Direct thing. I don't even bother to check to see how it looks. I don't do anything to publicize the book or to "sell" them -- at 99 cents mostly (they used to not let me price it below $2.99 when it first started, and I couldn't figure out how to get them for free). I like the idea that people discover the ebooks at random. Sometimes they obviously don't like them and can get their 99 cents back right away. I "sell" about one a day, slightly more than that, though around Xmas I was running at two a day. Frankly, I don't know why anyone would bother to get my books since they are available free elsewhere, like on websites or Scribd. But they're cheap. Where I disagree with you is that it's a waste of time to do a Kindle ebook if you don't try to sell it. I spend very little time (maybe 15 minutes) getting the book in Kindle form, and anyway, it's my hobby, just as writing has been since I started publishing my stories in little magazines in 1975 and books in 1979. It's so much easier now that we can rely on Amazon to do our distribution instead of that old inefficient distribution, when the dinosaurs always fucked up the supply chain. Now trying to deal with Smashwords wouldn't be worth my time. I just don't understand why people don't just turn all their old out-of-print, doing-nothing books as Kindle ebooks. But then maybe they still believe it would harm their "careers." Thanks for the comments, Richard Grayson -- actually, it was back in January that you first told me (in an email) about your experiences with Kindle publishing. I was intrigued by your approach and by the fact that, as you said, people were just "buying your books" for no apparent reason. That rocks! Your email in January inspired me to start thinking seriously about starting a Litkicks e-book publishing program, and as you can see I've now jumped in with both feet. So, thanks for posting this follow-up. I agree 100% with what you say here. As for my remark that e-book publishing is a waste of time without a sales strategy -- you're right that I may have overstated that. I was just trying to emphasize that e-book publishing takes a lot of time and effort, with small chance for big reward. But in your case, Richard, it clearly makes sense, maybe because your books have a natural appeal. (Here's a link to one of them, well worth checking out). I hope other fiction writers who are frustrated with commercial publishing will follow your lead. You are way too kind, Levi. But thank you. There's a kind of revolution out there. Last night at the PEN Prison Writing Awards reading of the wonderful drama prize winning plays by prisoners all over the US (the PEN Prison Writing Program is one of the best things going), I got to meet for the first time one writer I've idolized for forty years, who was curating the show at New Dramatists. As I told him, forty years ago, I read his memoir "Inside, Looking Out." It is simply one of the four or five best memoirs I've ever read, a book that if you do a search online for will probably turn up in "neglected masterpieces" or something. Later that decade, Pete Lemay became the head writer for my favorite soap opera since the early 1960s, "Another World," and produced some of the best daytime drama characters and storylines ever for the 8 years he was with the show. He told me that he just put "Inside, Looking Out" on Kindle and also his wonderful book, "Eight Years on Another World," out there. Those are exactly the kind of books we need published and that Kindle does so easily. I'm a pretty weak writer, but it's fun for me just to get my stuff out there. I've kept that daily diary since 1969 and I've been releasing excerpts (so far, getting up to 1980) in little Kindle books. I don't have any hope that people will find much value in them, except maybe as a historical curiosity someday, but I wish other people would publish their diaries, letters, emails, blog entries. For example, an ebook of your Internet memoir. You may have higher hopes for it, but it would be great to see it as an ebook. (I do all mine first as print books at Lulu with free downloads, but now no longer bother with the dead-trees versions.) The ebook, combined with print-on-demand may not change things for the big-name authors with big NY trade houses and lots of buzz and lots of fans, but for lots of others, it's a wonderful innovation. Check out Harding Lemay's "Inside, Looking Out"! This is an interesting post. I'm almost finished with my latest book, a memoir of mid-life crisis told in semi-humorous, sarcastic tone, and I'm planning on doing an e-book via Kindle thanks to Levi's encouragement here. My only problem is getting a great cover. I have no idea how to go about doing that! Help anyone? Richard, you sell about one book a day? Do you advertise at all? The reason I ask is, nobody buys my book. Ever. And see, here's the thing: I realize not everyone is going to like what I like, or relate to the same things I relate to, but I can't help but think a small niche of readers would really like it a lot. I've had some great reviews and compliments by people I've sent the book to. And these aren't just friends of mine trying to make me feel good; for the most part, they are people I've never met, who didn't have to review the book at all. They include Claudia Moscovici, Eric Lehman, Mayowa Atte, Adrian Dover, Mikael Covey, and others. Even Steve Aylett seems to like it, but it's hard to tell. The point I'm whining about is, how do you sell one a day? I mean, besides being a talented writer, which you are. Is the the titles? The cover? Name recognition? While I'm ranting, let me add this: Not only do a number of other people like my book, Tamper, I myself know it's a good book. I've spent years honing my craft and learning how to honestly look at my work to determine when it's really good or not. The good reviews validated what I knew and let me know that I'm not crazy. Bill, I haven't any idea. I don't try to do anything except get the titles on my blog (which gets 98% of its traffic from my photos, not anything to do with my writing), just so that Google search will capture them. My bestselling titles are "Inside Barbara Walters" and "Vampires of Northwest Arkansas," and I suspect most of the sales are to people who misunderstand what they're buying based on the titles. But weirdly, thirty of the ebooks have sold at least one title. For some reason, this month I've sold 2 US copies and 2 UK copies of a book, "Horsing Around in Politics," that had never sold before. It's a mystery to me, but I've been getting monthly royalty checks that range from about $10 to $25. (On the 99 cents books I get 35 cents for each one sold.) I don't think it would be cost-effective for me to do anything to promote them (unless you think these comments are that), I don't want to do it, as I really like the idea of people just discovering these things by accident, as if they are just browsing and impulse buying at a bricks-and-mortar store. I do check sales, but I have no way of tracking them or how they got to be sales unless -- for example, as happened with "The Brooklyn Diaries" -- someone reviewed it and Amazon and then friended me on Facebook so I knew her name. I'm sure she never finished the book, which runs over 600 pages in book form. I have only one "return" this month. It came after I got two more sales, so it's possible that sometimes people accidentally buy it twice. Other times people clearly don't like the book, I assume. So they get their 99 cents back. I suspect a lot of people don't like or finish the books but they don't want to bother to ask for such little money back. Thanks for the insights, Richard. I have a link to Tamper on my blog, so maybe I just need to give it more time, and continue making blog entries that would be of interest to the same people who would be interested in my book.